Despite clear legal rules and political commitments, no significant progress has been made in nuclear disarmament for two decades. Moreover, not even the use of these weapons has been banned to date. New ideas and strategies are therefore necessary. 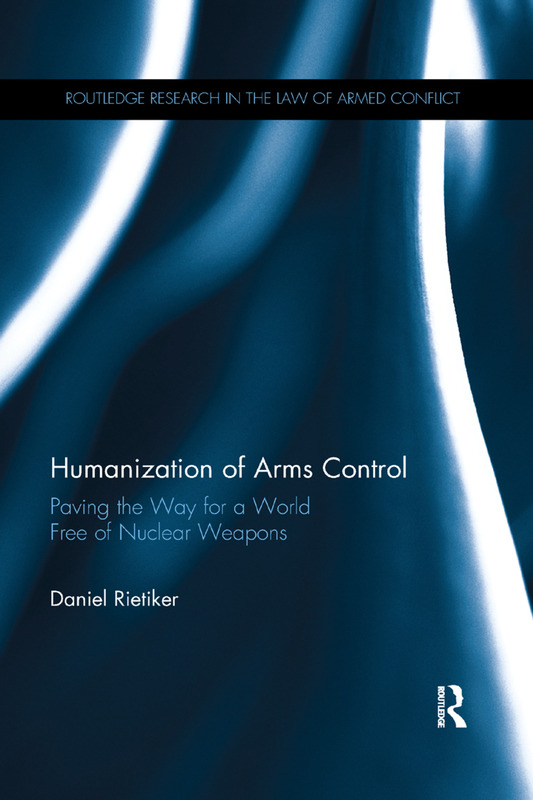 The author explores an alternative approach to arms control focusing on the human dimension rather than on States’ security: "humanization" of arms control! The book explores the preparatory work on arms control treaties and in particular the role of civil society. It analyzes the positive experiences of the movements against chemical weapons, anti-personnel mines, and cluster munitions, as well as the recent conclusion of the Arms Trade Treaty. The author examines the question of whether civil society will be able to replicate the success strategies that have been used, in particular, in the field of anti-personnel mines (Ottawa Convention) and cluster munitions (Oslo Convention) in the nuclear weapons field. Is there any reason why the most destructive weapons should not be outlawed by a legally binding instrument? The book also explains the effects of weapons, especially nuclear weapons, on human beings, the environment, and global development, thereby focusing on vulnerable groups, such as indigenous peoples, women, and children. It takes a broad approach to human rights, including economic, social, and cultural rights. The author concludes that the use of nuclear weapons is illegal under international humanitarian and human rights law and, moreover, constitutes international crimes under the Rome Statute of the International Criminal Court. In his general conclusions, the author makes concrete proposals for the progress toward a world without nuclear weapons. "Dr. Rietiker observes the lack of progress these past few decades in nuclear arms control, and traces it to the security-based model we have used to evaluate nuclear weapons. He also observes the progress made in other weapons control fields, by using a humanitarian-based model. Particularly important are the total bans on the use of anti-personnel mines and cluster munitions for humanitarian reasons. Certainly any use of nuclear weapons would create a profound humanitarian disaster. Thus Dr. Rietiker makes a detailed and impressive case for the outlaw of nuclear weapons for humanitarian reasons. This book presents factual background on the humanitarian disaster that would be caused by any use of nuclear weapons, and makes the legal case for outlawing nuclear weapons as has been made for those other weapons. Legal scholars as well as arms control specialists will find this book to be a valuable resource." —William J. Perry, US Secretary of Defense (1994-1997), author of "My Journal at the Nuclear Brink"
"The International Court of Justice, in its 1996 Advisory Opinion on Nuclear Weapons, evenly split and by the President’s casting vote, had stated that while the threat or use of nuclear weapons would generally be contrary to the rules of international law applicable in armed conflict, it could not conclude definitely whether such threat or use would be lawful or unlawful in an extreme circumstance of self-defence in which the very survival of a State would be at stake. Daniel Rietiker has made a challenging step towards solving this dilemma by focussing on issues of human security as opposed to a State centred thinking to secure a balance of powers. His book offers a comprehensive assessment of legal developments in the last two decades which have stressed the role of civil societies and individuals in international law-making, focussing on the 1997 Convention on the prohibition of anti-personnel landmines, the 2008 Convention on cluster munitions, and the 2013 Arms Trade Treaty. "This is a book on an excellent subject: the humanization of arms control by treaties such as the Conventional Weapons Agreement, the Ottawa (anti-personnel mines)and the Oslo (cluster munitions) Agreements, and the Arms Trade Treaty. A specialist of both disarmament and human rights law, the author examines the practice relating to these instruments and their implementation. He also studies agreements on nuclear weapons in the light of the requirements of international humanitarian and human rights law, before drawing general conclusions and making useful proposals for progressing toward a world without nuclear weapons. Mr. Rietiker’s book can be highly recommended for the way in which it shows how arms control initiatives could lead to a nuclear-free and therefore safer world. The author’s level-headed approach, based on a serious and sober analysis of the present, could be a milestone on the long path to that goal." -Prof. Lucius Caflisch, Honorary Professor of International Law at the Graduate Institute of International and Development Studies (Geneva), former member of the International Law Commission (ILC) and former Judge of the European Court of Human Rights (ECtHR), Switzerland. Daniel Rietiker (PhD) is a senior lawyer at the European Court of Human Rights and teaches international law and human rights at Suffolk University Law School (Boston, MA) and Lausanne University (Switzerland).